FELICITATION: Kavignar Dr. Jinnah Sherifdeen receiving the prize from Mrs. Suganthy (Attorney-at-Law) while Mrs. Jinnah Sherifdeen and President of the Colombo Tamil Sangam E. Suntheralingam look on. ART: The vice president of the Colombo Tamil Sangam Dr. Jinnah Sherifdeen was honoured and felicitated by the Colombo Tamil Sangam for having won the prestigious award for his literary work on ‘Pandara Vanniyan Kaviyam 2005’, National Sahitiya Award and Yarl Literary Circle Award. The felicitation ceremony which was held at the Colombo Tamil Sangam was presided over by the former president of the Sangam E. Suntheralingam. The vice presidents of the Sangam P. Wijeratnam, Balasritharan, Kathirgamanathan and Assistant Secretary A. Kandasamy participated in the function. 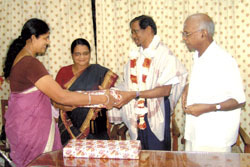 Miss Satsorupavathy Nathan, a well-known radio broadcaster and vice-president of the Colombo Tamil Sangam compered the programme while Mrs. Suganthy, distributed the prize to Dr. Jinnah Sherifdeen. The Tamil language and literature have a long history and they have been enriched by the literary works of great poets like Subramaniya Bharathy, Avaiyar and Thiruvalluvar. Even the great epics like ‘Ramayanam’ and ‘Maha Bharatham’ are of timeless and spaceless in quality. All these great epics have observed India’s cultural heritage, made it their own, enriched and given universal dimension and significance. Even when Sri Lanka underwent a terrible time in the early part of 18th and 19th centuries on account of western conqueror multi-faceted in its manifestations and consequences - political, economical, cultural and religious, people like Sri La Sri Arumuga Navalar, Sir Ponnambalam Ramanathan, Sir Ponnambalam Arunachalam, Sir Vaitilingam Duraisamy and several others sacrificed their lives for the revival of Tamil language, Tamil literature, culture and religion. Further, in regard to poetry, the modern poetry in Sri Lanka begins only in the 1940s with the emergence of Maru Malarchi (Renaissance) writers such as Mahakavi A. Kandasamy and Uaradar. In poetry, the chief figures were Murugaiyan, Neelavanam and few others. Mr. Murugaiyam wrote highly intellectual poems. There was Sillaiyoor Selvarajan, a master rhetorician whose instant verses were very attractive comments on politics as well. By the early 1970s some of the writers who had graduated to full-fledged novel writings were Ganeshalingam, Daniel, Ilankeeran, Nanthi, Senkai Azhian and C. Yoganathan. Dominic Jeeva’s ‘Mallikai’ was the chief forum for the publication of progressive writing. Dr. Jinnah Sherifdeen was very much involved in journalism from his young age and was under the benign influence of the great writer and editor-in-chief of ‘Thinapathy’ S. D. Sivanayagam. It was Sivanayagam who created an interest in writing which has resulted in making Dr. Sherifdeen as author of several books which have brought name and fame for him nationally and internationally. Kaviyam comprises 1,000 poems. Besides, his books on Maha Kavi Iqbal, Theddam (Short Story), Kaviyatanga Kavithaigal are still in print. In recognition and appreciation of his literary works Dr. Sherifdeen was presented with several awards and prizes on an all island basis. Furthermore, he was honoured an felicitated by several literary organisations in Sri Lanka and abroad. The Colombo Tamil Sangam felicitated him when he got the Kalabhooshanam award and the national Sahitya Award. Besides, he held several positions such as Literary Secretary of the Colombo Tamil Sangam, Administrative members of the Colombo Kamban Kalagam, Advisory Board members of the Thirumarai Kala Mandram and Vice-President of the Colombo Tamil Sangam. Dr. Sherifdeen is a multifaceted and multi-dimensional personality who has greatly contributed to the development of Tamil literature and poetry. His unparalleled enthusiasm total dedication and humanitarian gesture towards literary, cultural, social and religious activities are highly commendable and an inspiration to everyone around him. He is a remarkable writer, author and poet who translates thoughts and intentions into action, passion into reality, every minute into valuable moments. He is an exceptional human-being with exemplary character and high degree of discipline with humble and simple manners.